TOTALLY REMODELED! 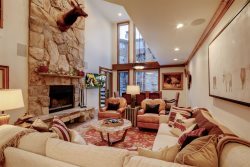 This 1496 square foot 2-bedroom, 2.5-bathroom unit has a fabulous view of the Deer Valley ski runs. The furnishings, décor and upgrades are of the highest quality. Enjoy the comfort and ambiance of this contemporary getaway. Relax after skiing in your private outdoor hot tub, or sit by the fire in the living room near the wood burning fireplace. The living room and master bedroom have large flat screen TVs with High Definition cable service. If you are dining in, you will find top of the line appliances and a fully equipped kitchen. The large master bedroom has a California king bed and wood burning fireplace. The master bathroom offers a spa-like experience with a soaking tub and separate shower. The second bedroom has a twin over full size bunk bed with its own on-suite bathroom with a walk-in shower. 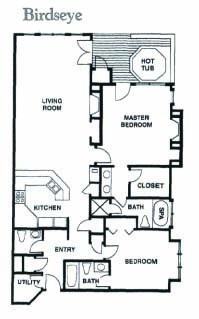 For added convenience, there is a washer/dryer and a beautiful ½ bath. This one of a kind 2-bedroom unit is your perfect ski-in/ski-out accommodation!